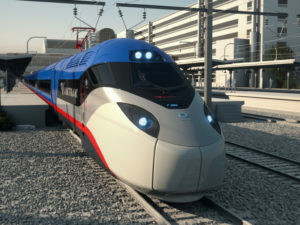 From moving record numbers of passengers on Victorian infrastructure to rebuilding major railway stations, Network Rail and US railway company Amtrak have much in common. Amtrak Executive Vice President Stephen Gardner visited Network Rail’s state-of-the-art control centre at Three Bridges in Sussex and also went on a behind-the-scenes tour of London Bridge station – currently being rebuilt by Network Rail as part of the Thameslink Programme – as part of a fact-finding trip to see how investment is transforming the railways in and around the capital. Amtrak owns and operates North America’s busiest railway route connecting Washington DC, New York and Boston. Faced with ageing infrastructure and congested major railway stations, such as Penn Station in New York, Amtrak is making the case for investment and is looking to Network Rail’s experience of delivering major upgrades such as the Thameslink Programme for inspiration. “It is life-changing investment that is happening here. The challenge for railways is always to have the presence of mind, amidst all the immediate demands, to understand the needs of the coming decades and to create the capacity to provide for them. “What is particularly impressive here is the scale of the investment and the magnitude of concurrent projects. The UK is making a generational change to the network and the thought and care with which the work has been done and the ‘system view’ that has been taken is very important. “For us in the States, we are just starting on the task of addressing the multitude of hundred year old assets that our railway relies on and we have to convince people to invest in renewing these and expanding capacity for the generations ahead. The Thameslink Programme is creating the capacity to run trains every two- to three minutes between London Blackfriars and St Pancras International and rebuilding London Bridge station, all part of Network Rail’s Railway Upgrade Plan. Further afield, investment in Network Rail stations such as Birmingham New Street and King’s Cross, have succeeded in driving regeneration and economic growth. “Investment in the railway generates economic growth and supports new jobs and housing. “Our work to rebuild London Bridge station is already having a positive impact on the local area, and when our work is complete in 2018 the improvement in train services will unlock further growth across London and the south east of England.